We’ve mentioned Prakriti School multiple times on our website. It’s quite an unusual school in Noida, Utter Pradesh, which puts kids-centric, experimental and explorative learning in the centre of its curriculum. The school doesn’t look like a “normal” school – it has an amphitheatre, everything is open, the groups are small and the teachers aren’t the usual “authorities”. At Prakriti they understand learning as a life-long endeavour. Which in fact it is. That is pretty much what we do in Janwaar as well – except that we don’t have a traditional curriculum attached. 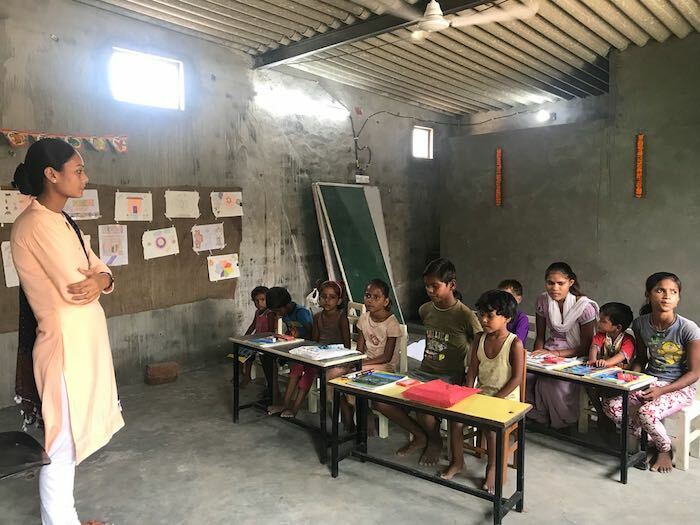 We partner with Prakriti – or better – they help us in Janwaar in various ways: they’ve done teacher training at the local government school, they’ve conducted workshops with our kids and some of our kids get trained at Prakriti school in Noida itself. Currently we are experimenting together on a model school concept for Janwaar. More about this soon. Prakriti is presently building a new school in Greater Noida, right next to the Noida Expressway. Last week I visited the construction site for the second time – I was amazed to see the progress, they are already one floor up and they aim to open the doors in April next year! It’s always nice to see things taking shape. Before we crawled up the slippery “jugaad” stairs to the first floor we passed by the houses for the construction site workers. Many of the families here were from Madhya Pradesh, the state where Janwaar is located. For the duration of the construction the families stay right next to the construction site. This is pretty normal in India. And usually the whole family – man, wife and children – is coming. While the women carry the bricks, cement and all the other stuff which is needed, the men work as carpenters, masons, plumber and so on. And the kids are roaming around at the site … mainly left alone. I was very much surprised – in a very positive way – that this wasn’t the case here. Right next to their shacks there was a school! A decent classroom with a huge fan, the kitchen was just about to be finished, and two teachers interacting with maybe 10 kids of different age-groups. The driver who had dropped us at the site had brought toys from the other school and the walls of this temporarily school were already plastered with paintings from the kids. “What is this?”, I asked Bharti. “This is so nice to see!” Bharti told me that they cooperate with Mobile Creches – an NGO wich offers meanwhile their services in Delhi area, Mumbai and Pune. 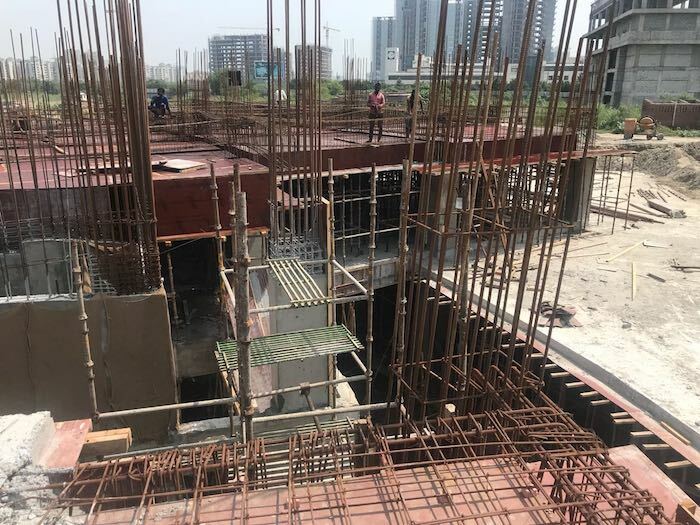 Their programme at construction sites ensures creche services to 5,000 children of migrant workers at meanwhile 40 locations in Delhi/NCR alone. Prakriti Xway is one of these sites. The NGO brings in the teachers and the short term curriculum, the people who run the construction site provide the facilities and pay the teachers. I realy liked this concept. And what I even liked better, was the fact that Prakriti was using these services. It clearly shows their commitment that learning should be accessible for every kid. They truly walk their talk. Thank you! Re-thinking what a school could be!